In the older days, wood and bamboo ladders were used, but in this modern world, aluminum and fiberglass ladders have come onto the scene. The aluminum and fiberglass ladders have their own advantages and disadvantages. When comparing aluminum and fiberglass ladders, one of the main differences that can be noticed is their strength. When compared to the aluminum ladders, the fiberglass ladders are very strong. It does not mean that aluminum ladders are not strong, but the strength depends on the grade of the material used. An aluminum ladder with a low grade could bend easily. When compared to aluminum ladders, the fiberglass ladders could crack. Another noticeable difference is with regard to resistance to weather conditions. Unlike the aluminum ladders, the fiberglass ladders are more resistant to weather conditions. It can also be seen that fiberglass ladders are resistant to electricity. As fiberglass does not conduct electricity like aluminum, these ladders are used more when working around power lines. Another difference that can be seen between fiberglass ladders and aluminum ladders is that the former ones are more flame resistant. When talking about heat, aluminum ladders conduct heat, whereas the fiberglass ladders do not. When exposed to heat, aluminum ladders lose their strength, and it could become difficult to use the ladder in a comfortable manner. On the other hand, fiberglass ladders do not weaken under heat. One of the advantages of aluminum ladders over fiberglass ladders is that the aluminum ones are lighter. 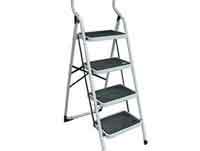 Aluminum ladders can be carried to any place with ease. As fiberglass ladders are heavier, they cannot be used as long extension ladders. Moreover, fiberglass ladders come with a higher price than aluminum ladders. 1. Fiberglass ladders come with a higher price than aluminum ladders. 2. When compared to the aluminum ladders, the fiberglass ladders are very strong. 3. Unlike the aluminum ladders, fiberglass ladders are more resistant to weather conditions. 4. Fiberglass does not conduct electricity like aluminum, and so these ladders are used more when working around power lines. 5. Fiberglass ladders are more flame resistant than aluminum ladders. 6. When compared to fiberglass ladders, aluminum ladders are lighter. 7. When exposed to heat, aluminum ladders lose their strength, and it could become difficult to use the ladder in a comfortable manner. On the other hand, fiberglass ladders do not weaken under heat. Prabhat S. "Difference Between Aluminum and Fiberglass Ladders." DifferenceBetween.net. April 8, 2010 < http://www.differencebetween.net/object/difference-between-aluminum-and-fiberglass-ladders/ >.